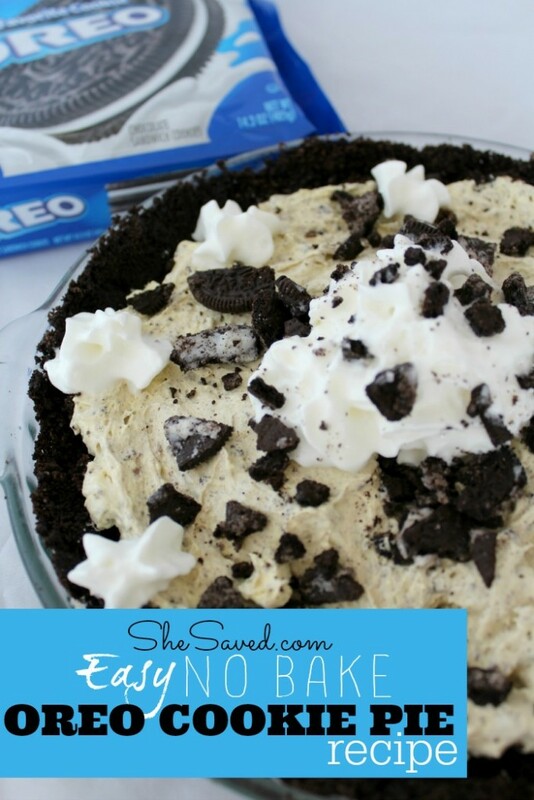 Just about everyone loves Oreo Cookies, which makes this Easy No Bake OREO Cookie Pie Recipe perfect for just about any occasion! Even better, it takes about 15 minutes to make, no baking involved, which makes it perfect a perfect recipe for the kids to help out with! As you can imagine, they will enjoy every minute of mixing up and creating this delicious recipe and they will enjoy eating it even more! This recipe is a great one to make in a pinch as it really is quick and easy, and affordable too! Crush 24 to 28 cookies (You can use a blender if you wish). Mix with melted butter and pressed onto the bottom and sides of a 9-inch pie plate. Beat milk and pudding together for 1-2 minutes, or until thick. It will be pretty thick, almost like a custard. Carefully stir in whipped topping and blend well. Crumble 12 Oreo cookies (more if you like) and fold into the pudding mixture. Spoon into crust. Decorate with Oreos as you wish and refrigerate for at least four hours. Enjoy! Decorate with Oreos as you wish and refrigerate for at least four hours. Delicious! This recipe is a keeper.